Don’t re-invent the wheel! What successful entrepreneurs know can help make you a success—and avoid the mistakes they made. Hear their candid, first-hand stories—free! Click to Watch – Learn about leveraging your expertise! Nate Lind is the founder of Adsum, the Legends mastermind group, and a multi-million dollar ecommerce company selling hair care products for women and men. He has had a fascinating journey going from canning pack house to his education at the art institute to a junior programmer to selling and buying 50 million dollars of real estate to consultant for fortune 500 banks to multimillion dollar ecommerce company to Adsum. Click to Watch – Find out why you need to know your strengths! Rusty Jones and Tom Bushkie are the founders of Hello Water. Hellowater is fiber infused with zero grams of sugar and five grams fiber to help with a healthy lifestyle. Hellowater is also a fresh delivery system for fiber with exciting flavors such as Dance, which is their orange mango version. You can find Hellowater at Target, Jewel Osco, Woodmans, on Amazon and many more retailers across the country. Click to Watch – Find out how to restore your gut health! Ryan Lee is the founder of REWIND and the Superfood bar. The company can be found on rewindtoday.com – Ryan has over twenty-two years in the health and fitness industry (Master’s Degree in Exercise Physiology, Created the world’s fastest workout video, ect). Anyone who follows Ryan knows he is obsessed with living a good and healthy life with his wife and four kids at the forefront. Click to Watch – Learn how to build your tribe! Mike McKim is the co-founder of Cuvee Coffee Roasting Company. Cuvee Coffee Roasting Company has been providing independent coffee houses and coffee enthusiasts with sustainable artisan blends, single origin, and estate coffees since 1998. Mike is also a board chairman at the non-profit, Operation Supply Drop that supports today’s active duty military and their families. Cuvee Coffee is a nationally recognized specialty coffee roaster with its roots firmly established in Texas. Cuvee Coffee and cold brew can be found at their website, Whole Foods, Heb, Central Market, Target, and soon to be limited Safeways. Click to Watch – Find out why persistence pays off! 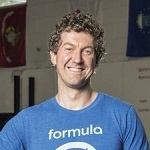 Dan Meadors is a co-founder of The Wholesale Formula with Eric Lambert. They began selling on Amazon as a hobby with an original investment of only $600. They worked nights and weekends buying products on clearance at local retail stores and selling them on Amazon for a profit. It only took a few months before they saw the potential to turn this hobby into a business as they both left their day jobs to sell on Amazon full-time. Since then they have been able to generate over $20,000,000 in sales on Amazon. Dan and Eric have developed their own unique system to take advantage of wholesale opportunities called The Wholesale Formula. Click to Watch – Hear about an Ecommerce Success Story! Tara Bosch is the founder of SmartSweets, her mission is to help you kick sugar! She started SmartSweets after forming an unhealthy relationship with food and seeing the negative effects sugar has on our health. After spending months recipe testing in her kitchen with a gummy bear mold from Amazon, Tara created a healthy gummy bear. Tara and her team were able to raise 3.6 million dollars to get their business off the ground. Today, you can find SmartSweets in over 10,000 stores like Whole Foods, Target, GNC and many online channels. Click to Watch – Learn about kicking sugar from your diet! Courtney Nichols Gould is the CEO of SmartyPants Vitamins. SmartyPants Vitamins have a gummy obsession which started because they believed that the very best vitamins are an all in one combination of different nutrients that would save money, time and peace of mind for customers. Their products can be found on Amazon, in Whole Foods, Kroger, Target, Costco and many more locations all over the US. Their bottle is the one with the cute owl winking at you. For every bottle sold they make a 1 for 1 grant to Vitamin Angels to provide children in need with nutrients and they have made over 6.2 million nutrient grants to date. Click to Watch – Learn about the value of transparency! Tom Kulzer is the founder of AWeber. AWeber is one of the top email marketing providers on the planet and helps over 100,000 businesses build their audience. Tom started AWeber all the way back in 1998. Click to Watch – Learn about the impact of automation and email marketing! Dave Colina is the co-founder of O2 which started in Columbus, OH in 2014. O2 Oxygenated Natural Recovery drink was created by a CrossFit trainer and a medical doctor who were sick of unhealthy sports and energy drinks. It has electrolytes, natural caffeine, and added oxygen to help your body process toxins faster. They’ve gone from slinging O2 out of the back of a Prius to becoming a top seller at hundreds of CrossFit gyms and Whole Foods stores in Ohio, Kentucky, Pennsylvania, DC and Maryland as well as Krogers. Click to Watch – Learn about creating a natural recovery drink!